Nord is the country's most populous department. It also contains the metropolitan region of Lille, the fifth-largest urban area in France after Paris, Lyon, Marseille, and Toulouse. Within the department is located the part of France where the French Flemish dialect of Dutch is still spoken (along with French) as a native language. Like Dutch, the dialect of Ch'ti [] is still spoken. Tribes of the Belgae, such as the Menapii and Nervii were the first peoples recorded in the area later known as Nord. During the 4th and 5th Centuries, Roman rulers of Gallia Belgica secured the route from the major port of Bononia (Boulogne) to Colonia (Cologne), by co-opting Germanic peoples north-east of this corridor, such as the Tungri. In effect, the area known later as Nord became an isogloss (linguistic border) between the Germanic and Romance languages. Saxon colonisation of the region from the 5th to the 8th centuries likely shifted the isogloss further south so that, by the 9th century, most people immediately north of Lille spoke a dialect of Old Dutch. This has remained evident in the place names of the region. After the County of Flanders became part of France in the 9th century, the isogloss moved north and east. Extent of West Flemish spoken in the arrondissement of Dunkirk in 1874 and 1972 respectively. During the 14th Century, much of the area came under the control of the Duchy of Burgundy and in subsequent centuries was therefore part of the Habsburg Netherlands (from 1482) and the Spanish Netherlands (1581). Areas that later constituted Nord were ceded to France by treaties in 1659, 1668, and 1678, becoming the Counties of Flanders and Hainaut, and part of the Bishopric of Cambrai. On 4 March 1790, during the French Revolution, Nord became one of the original 83 departments created to replace the counties. Modern government policies making French the only official language have led to a decline in use of the Dutch West Flemish dialect. There are currently 20,000 speakers of a sub-dialect of West Flemish in the arrondissement of Dunkirk and it appears likely that this particular sub-dialect will be extinct within decades.There is, however, a movement to bring back use of the Dutch language as a second official language. 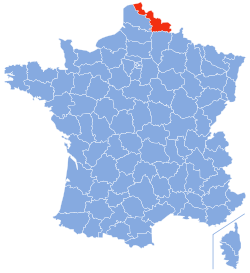 Nord is part of the current Hauts-de-France region and is surrounded by the French departments of Pas-de-Calais and Aisne, as well as by Belgium and the North Sea. Nord is the most heavily populated department, with a population of 2,617,939 and an area of 5,743 km². The President of the Departmental Council is the unaffiliated right-winger Jean-René Lecerf. The first President of the Fifth Republic, General Charles de Gaulle, was born in Lille in the department on 22 November 1890. Nord's 3rd constituency Christophe Di Pompeo La République En Marche! Nord's 4th constituency Brigitte Liso La République En Marche! Nord's 6th constituency Charlotte Lecocq La République En Marche! Nord's 8th constituency Catherine Osson La République En Marche! Nord's 9th constituency Valérie Petit La République En Marche! Nord's 11th constituency Laurent Pietraszewski La République En Marche! Nord's 12th constituency Anne-Laure Cattelot La République En Marche! Nord's 15th constituency Jennifer de Temmerman La République En Marche! Nord's 17th constituency Dimitri Houbron La République En Marche! At the forefront of France's 19th century industrialisation, the area suffered severely during World War I and now faces the economic, social and environmental problems associated with the decline of coal mining with its neighbours following the earlier decline of the Lille-Roubaix textile industry. Until recently, the department was dominated economically by coal mining, which extended through the heart of the department from neighbouring Artois into central Belgium. This page was last edited on 14 March 2019, at 18:53 (UTC).